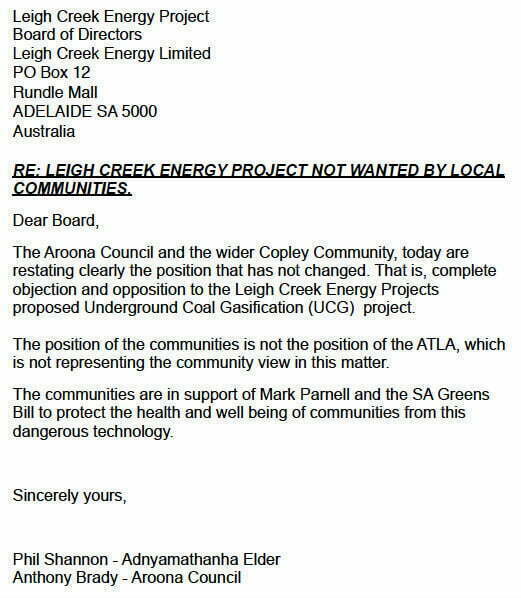 The Copley Community have again sent a clear message to the Leigh Creek Energy Project. Their Underground Coal Gas (UCG) Project is considered unsafe and is not welcome in the region, reports Michael Henry. 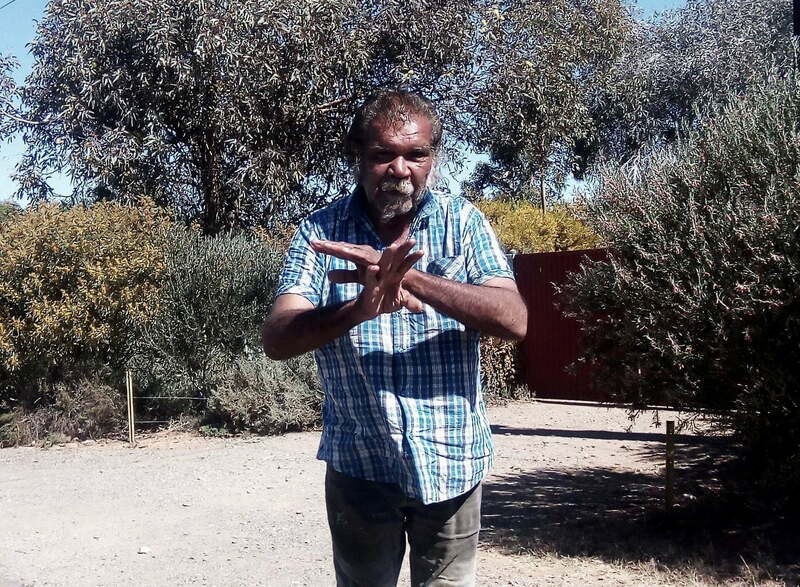 Aroona Council Chairman Anthony Brady and Adnyamathanha elder Phil Shannon presented a letter to the company yesterday stating the views of the Adnyamathanha Traditional Land Owners Association (ATLA) are not the views of local Adnyamathanha nor the wider community potentially impacted by the project. 1/ A complete scientific review of any studies presented by LCK can be undertaken by the community at LCK’s expense. 2/ No progress with any permit application could proceed until the complete outcome of the Queensland EPA versus Linc Energy trial ( willful negligence) is known. The LCK project is based on the same technology used by Carbon Energy and Linc Energy. The State Greens led by MLC Mark Parnell and the local communities are keen to see the passing of the Bill to ban UCG extraction in the state, bringing the state into line with the other Australian states and territories. Like a bad zombie movie, the undead have come back to haunt us. Members will remember Marathon Resources Limited. That is the cowboy mining company that was sent packing from the Arkaroola Wilderness Sanctuary five years ago after trashing the natural environment. They are back. Quietly rebranded as Leigh Creek Energy Limited, they now want to get into the UCG business, that is, underground coal gasification. It is nasty, polluting and dangerous, which is why it has been banned in Queensland. 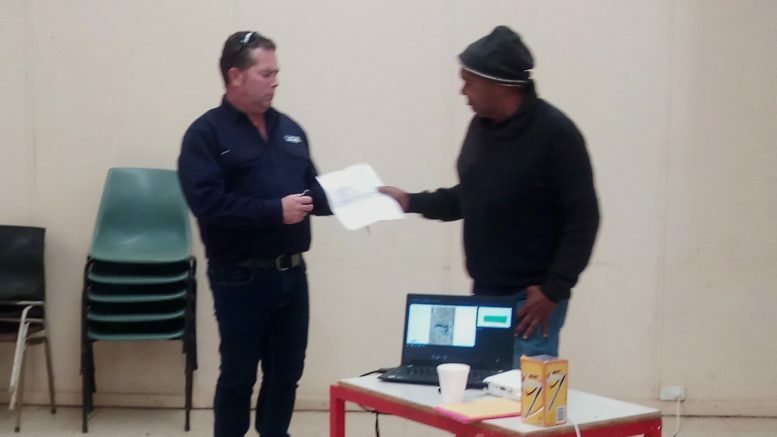 This development follows more recent controversy regarding previous manager of Linc Energy Justyn Daniel Peters and concerns raised by the Adelaide Advertiser regarding his peculiar non-disclosure of shares in the Leigh Creek Energy Project. LEIGH Creek Energy chairman Justyn Peters says his directorship of a company which owns almost a third of Leigh Creek Energy (LCKE) does not need to be declared in the company’s annual report. LCKE’s annual report claims Mr Peters does not have an interest in any shares in the company. “The number of ordinary shares in the company during the 2017 reporting period held by each of the group’s key management personnel, including their related parties, is set out below”, the annual report states. Mr Peters’ interests are listed as zero. However Mr Peters is a director of Allied Resource Partners which owns 29.99 per cent of LCKE. Mr Peters is also a shareholder in Allied, owning 670,838 of the company’s 30 million shares. The Corporations Act declares that: “A director of a listed public company must notify the relevant market operator … of … relevant interests in securities of the company or a related body corporate’’. The company’s corporate governance statement declares that: “A listed entity should disclose: if a director has an interest, position, association or relationship of the type that might cause doubts about the independence of the director’’. When queried by The Advertiser, Mr Peters said in a statement: “This information is publicly declared on the Leigh Creek Energy website, in the Chairman’s profile section. It is not required to be disclosed in the annual report’’. “Leigh Creek Energy and its Chairman, Mr Justyn Peters, have met all disclosure requirements of the Australian Stock Exchange. The company has also denied that commercial dealings with Crown Ascent Development, which owns 3.9 million shares in Allied, constitute related party transactions, which would have to be declared in the annual report. “Crown Ascent is contracted by LCKE, under a non-exclusive mandate, to pursue capital raisings for LCKE’’ the company said. “Crown Ascent was the consultant that achieved the recent $20 million capital raising for LCKE.LCKE has other consultants that also pursue capital raisings on its behalf. This is standard practice for a publicly listed company. An ASIC guide to related party transactions states: “A ‘related party transaction’ is any transaction through which a public company or registered managed investment scheme provides a financial benefit to a related party (such as a director, their spouse and certain other relatives). A groundswell of local opposition now adds to the unlikelihood of the project gaining further approval. The Greens are collecting online signatures for the petition to have UCG mining banned in South Australia.